ENDURANCE team member Vickie Siegel adjusts the autonomous underwater vehicle’s buoyancy prior to its deployment in the lake. Jupiter'sgiant moon Europa is one of the few places in our solar system where scientistsbelieve there is a reasonable chance that life has made a home. An ice-coveredworld with a vast frigid ocean beneath, Europa will not be an easy place to explore.If there is life there, it's likely to be in the ocean, and although the moon'ssurface may hold clues to what lies below, making a comprehensive plan tosearch for life on Europa means figuring out how to probe its watery depths. NASA'sENDURANCE project — the acronym stands for Environmentally Non-DisturbingUnderwater Robotic Antarctic Explorer — is a stepin that direction. Funded by the agency's ASTEP (Astrobiology Science andTechnology for Exploring Planets) program and headed by Peter Doran, aprofessor of earth and environmental sciences at the University of Illinois atChicago, ENDURANCE has completed the first of two field seasons exploring theice-covered Lake Bonney in Antarctica's McMurdo Dry Valleys. Antarctica'sice-covered lakes, said Doran, "can be used as models of an ice-covered oceanon Europa on a much smaller scale." Althoughscientists have studied Lake Bonney for years, their efforts have consisted ofannually boring a small hole in the ice at various points in the lake and droppinga sensor or two into the water below. The lake stretches for 1.5 kilometers(just under 1 mile); at its widest point it is about half a kilometer (a thirdof a mile) wide. With so little data about such a large lake, Doran said, itwas all but impossible to develop a dynamic understanding of its underwaterenvironment. TheENDURANCE autonomous underwatervehicle (AUV), designed and built by Bill Stone and his colleagues at StoneAerospace in Del Valle, Texas, has enabled scientists to begin to construct amore-comprehensive, three-dimensional understanding of the lake. "TheENDURANCE vehicle was unbelievably useful in seeing parts of the lake we'dnever seen before and looking at it in a completely different way," Doransaid. Eachday for a month, ENDURANCE dipped down through a hole in the ice in themiddle of the lake, and following preprogrammed instructions, traveled to adifferent part of the lake. At regular intervals it would stop, lower itsinstrument package of temperature, chemical and biological sensors to variousdepths and record the results. At the end of the day, it would return to thehole and rise to the surface, where it would be fished out by a crane andplugged in for an overnight battery recharge. Althoughengineers maintained a fiber-optic connection to the vehicle that enabled themto "watch what it's doing and watch the decisions it's making," Doransaid, the vehicle operated entirely on its own, without human intervention. "Whenit got close to the hole was the most impressive part to me. It had anupward-looking camera that would find the hole. It would center itself on thehole, and then ride up without touching the edges at all." Logisticswere a major challenge for the ENDURANCE team. 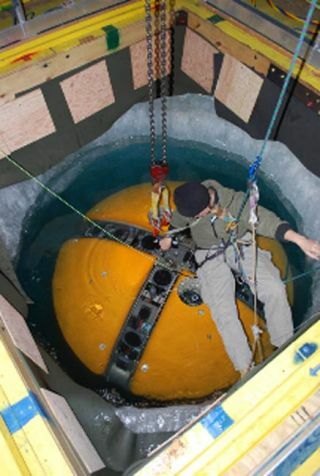 The nearly spherical submersibleis about 2 meters (6.5 feet) in diameter and in air weighs more than 1300kilograms (about 1.5 tons). Before Doran's team could deploy it, they first hadto melt a hole in the lake's 4- to 5-meter-thick ice cover, a hole large enoughto lower ENDURANCE through. That task alone took 3 days. Then, centered aroundthe hole, they had to construct the "Bot House," a fabric-coveredtemperature-controlled workshop, complete with doors and windows, an electricalsystem and a floor strong enough to support both ENDURANCE and the crane usedto lift it. Naturealso threw a couple of curve balls at the team. Unseasonably warm weather wasone problem. Taylor Glacier rises steeply from the west end of Lake Bonney, thetip of the glacier extending down below the surface of the lake. One of thegoals of the project is to create a photomosaic of the underwater face of theglacier, which has never before been studied. But the warm weather caused atorrent of water to gush from the face of the glacier into the lake, causingthe lake water to turn from crystal clear to nearly opaque. "Because ofthe murkiness we couldn't put together the photomosaic," Doran said. Heplans to begin the underwater glacier-imaging work earlier in the next fieldseason, before the glacial runoff begins. Anotherproblem was bubbles. High levels of saturated gases in the lake water caused "microbubbles[to] form on surface on the AUV, and they change over time as it's swimming,and so that really wreaks havoc with the buoyancy of the vehicle," Doransaid. "The bubbles would make it lighter," so EDURANCE "had touse a lot of battery power to thrust itself down." Doranand his colleagues had some familiarity with the Lake Bonney environment fromprevious work, but "as smart as we all were, we didn't predict thismicrobubble effect, and that we would have to come up with some way to overcomebuoyancy," Doran said. "You can't predict everything. It really hasimpressed upon me how difficult and risky it is." Doransaid the "take-home lesson" for any futuremission to Europa is, "You need adaptability." Practicing inAntarctica, where engineers are standing by, ready to make needed tweaks tohardware and software, is one thing. But a robotic probe, hundreds of millionsof miles from Earth, submerseddeep within the ice-covered ocean of another world, Doran concluded, "isonly as good as what you put on it."